Glow in the Dark Show | tessa.yvonne.morrison. Posted on April 4, 2013 by tessa.morrison. 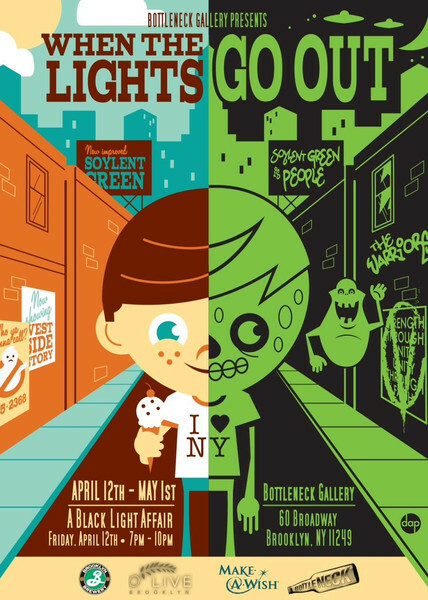 From April 12, to May 1, 2013, Bottleneck Gallery in Brooklyn, New York, is curating an exhibit called “When the Lights Go Out.” It is a glow in the dark themed art show where the gallery will be illuminated by black lights! Super fun! Bottleneck is ran by Joseph Bouganim and if you are in the Brooklyn area around then, you should go check out the show and tell him I say hi! Recently, I experimented with some glow in the dark glass frit, so when I heard about this exhibit I jumped on the chance to use it some more! Here are pictures of my fused glass triptych entitled “Trichromatic Triptych” in natural light, under blacklight, and under no lighting conditions. (Note: I accidently flipped the blue and yellow tiles in the natural lighting one. The blue one is in the middle in the other photos. So the blue tile is the one that glows the most.) This fused glass triptych will be fore sale at the gallery, the whole set is $650.00, or $250.00/ea. Each tile is approximately 6″X14.” Displaying them all together takes up about 20″X14″ of space, that is including an inch spacing in between each one. This entry was posted in Art Exhibits, Fused Glass Art and tagged Austin artist, Bottleneck Gallery, contemporary art, fused glass, glass art, glow in the dark, glow in the dark art, glow in the dark glass, Helios Kiln Glass Studio, Tessa Morrison, When the Lights Go Out by tessa.morrison.. Bookmark the permalink.